Did you know that the food we buy in U.S. supermarkets travels approximately 1,500 miles from farm to plate? Food comes to most of us by the way of a global food system – a system that is destructive of both natural and social communities. Corporations now control the production, processing, distribution, and consumption of most food, and are the chief beneficiaries of the global food system. Those who want to eat ethically and protect local agriculture are turning to locally grown food as the eco-healthy choice. 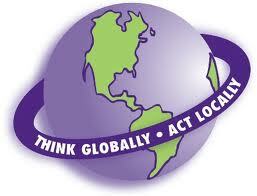 Think Globally, Act Locally is a concept that global environmental problems can turn into action by considering ecological, economic, and cultural differences of our local surroundings. The phrase has been used by environmentalists to summarize a plan for preserving the earth’s scarce natural resources at the local level – a plan to change the world one community at a time (Winogras & Hais, 2009). Today we live in a global economy, a borderless society, where goods from around the world can be easily acquired anywhere. In theory, this is an advantage to both consumers and producers in terms of choice, diversity, and cost. Producers search globally for the best available price for their goods, and consumers in turn take advantage of the best prices at their local markets. The global food market can also provide a great deal of consumer choice in the wealthier countries, where a variety of meat, produce and packaged goods from around the world is available in addition to locally grown agricultural products. The global food system can diminish seasonal shortages in addition to those shortages caused by poor harvests. If fruit from Florida is not available, fruit from Chile probably is, or corn from Mexico, or beef from England. A major concern is the food quality and the transmission of diseases as the United States government does not have the same capacity or power to inspect foreign factories, farms and processing plants, as it does with domestically produced foods. Plus, shipping food over great distances requires enormous amounts of fuel. By the time Chinese rice reaches markets in the U.S., it is no longer a bargain with it’s significantly larger carbon foot print. And if local farmers are forced out of the market by foreign competition, there is a risk of an inadequate food supply should those foreign imports fail for any reason. The global food system is based on an economic theory that says instead of producing a diverse range of food crops, each nation and/or region should specialise or concentrate on one or two globally-traded commodities. The decision is based on what items they can produce cheaply enough to compete with every other producer of that item. The profits from exporting those specialized commodities are then used to buy the food for local consumption. Theoretically everyone should benefit; in reality the theory is flawed. The global food system has become a major cause of hunger and environmental destruction worldwide (Kloppenburg, Hendrickson, and Stevenson, 1996). The global food system demands a centralised collection of tremendous quantities of single crops or monocultures that require huge amounts of pesticides, herbicides and chemical fertilizers. This effectively eliminates any biodiversity from the farmland and results in soil erosion and depletion of oxygen in waterways and the poisoning of neighbouring ecosystems. And since this global food is destined for distant markets, food transport has become a major contributor to fossil fuel use, pollution, and greenhouse gas emissions. Ironically, much of this transport is unnecessary as the ‘logic’ of global trade causes countries to import and export the same commodity, usually at the same time (Kloppenburg, Hendrickson, and Stevenson, 1996). Many farmers are recognizing the social and environmental rewards of sustainable agriculture, and most consumers appreciate the benefits of fresh and sustainably produced food. These producers and consumers are being linked through community supported agriculture and farmer’s markets. Most communities have farmer’s markets and locally grown produce is offered at local merchants – many large grocery chains like Kroger recognize the value of promoting local agriculture and food industries. But major super centers like Walmart engage in global food practices. For them, buying in bulk means cheaper to buy and cheaper to sell. Unfortunately, the lure of a few pennies savings for many consumers often eclipses the desire or need of buying locally produced merchandise. While we can certainly still enjoy the exotic fare from far flung countries from time to time, it is better to purchase locally grown food when possible for many reasons…better, fresher, safer food; economic support for the community that encourages growth (and eventually lower costs); less pollution to the atmosphere and waterways of the world; and a greater sense of community. It could almost be considered a Civic Duty. Besides, a tomato picked green in order to make the long journey from foreign field to the dinner plate cannot compete with a vine-ripened tomato fresh from the garden. I am so grateful to live in a community with a thriving farmers’ market. I get almost all my fresh produce, eggs, and honey from the market. It is often less expensive and more flavorful than commercial produce. But, when I do have to shop for produce, meat, and other food products at the grocery store, I look for a “locally grown” label. Here in California, sustainable, local food is a big deal and many of our local grocery stores cater to the movement with local food sections. It is a great change that was a long time coming. Hopefully, it will spread to other stores around the country. Thank you for your comments, Leigh. It is a BFD (as Joe Biden would say) to me too. Much rather support my local economy than support businesses like WalMart and Monsanto who are only destroying our way of life.